Formule 1 is a chain of over 360 hotels around the world for sleeping well at the lowest price 24/7. 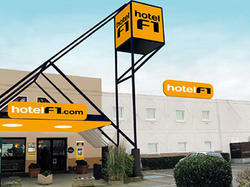 In France, Formule 1 has become hotelF1, the new generation of low-cost hotels. 270 ultra-economical hotels with parking and WIFI which are beingentirely refurbished to provide you with more comfort and modernity. New Duo or Trio rooms for your professional or private stopovers. Outside the room is a spacious and well-appointed "Showers and Toilets" area.